Tolerance. To measure tolerance we included four statements on the survey to which students could express their level of agreement or disagreement: 1) People who disagree with my point of view bother me; 2) Artists whose work is critical of America should not be allowed to have their work shown in art museums; 3) I appreciate hearing views different from my own; and 4) I think people can have different opinions about the same thing. We combined these items into a scale measuring the general effect of the tour on tolerance. Overall, receiving a school tour of an art museum increases student tolerance by 7 percent of a standard deviation. As with critical thinking, the benefits are much larger for students in disadvantaged groups. 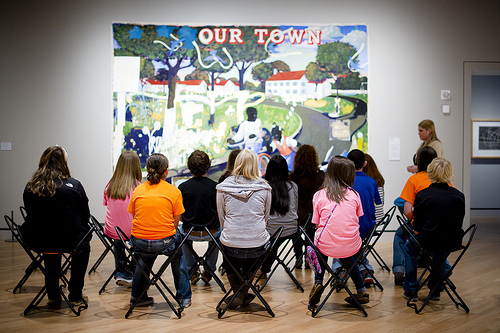 Rural students who visited Crystal Bridges experience a 13 percent of a standard deviation improvement in tolerance. For students at high-poverty schools, the benefit is 9 percent of a standard deviation. The improvement in tolerance for students who went on a tour of Crystal Bridges can be illustrated by the responses to one of the items within the tolerance scale. When asked about the statement, “Artists whose work is critical of America should not be allowed to have their work shown in art museums,” 35 percent of the control-group students express agreement. But for students randomly assigned to receive a school tour of the art museum, only 32 percent agree with censoring art critical of America. Among rural students, 34 percent of the control group would censor art compared to 30 percent for the treatment group. In high-poverty schools, 37 percent of the control-group students would censor compared to 32 percent of the treatment-group students. These differences are not huge, but neither is the intervention. These changes represent the realistic improvement in tolerance that results from a half-day experience at an art museum. Did you go on field trips when you were in school? If you have children do they have school field trips? what did you learn from your trips? What will we be losing if schools cut back on trips?